The floor appears to be done also in matching marble. 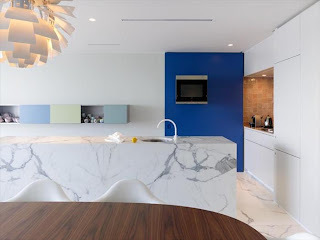 I like the intense blue tapering off into pastel cabinets — it seems almost daring — but the recessed stove area seems completely wrong. Maybe it's not the lighting so much as the jarring beigeish brown that bothers you. I'd like to see things from the opposite angle to see if there's a theory behind it. The artichoke lamp has a copper underside to some of the leaves, which gives it that mysterious brownish glow, and the table is dark brown, but the three browns don't seem to relate to each other. I hope I'm just missing the point, because it all seems very purposeful, anything but haphazard. Still, things seem to clash where marble normally suggests permanence and conclusion. Anyway, since you asked, that's my pre-holiday take. The psychiatrist in me — no, I don't even play one on TV — can't help but notice that since ICFF, with the possible stainless steel exception of "Top Drawer Design" which nonetheless salvaged a trade mark pun, your posts have absolutely banished the mundane. From the kooky kitchen with a portholed door, the bathroom on a pole, the stove doubling as a Union Jack, the emerald oasis, the bright watercolored bathroom, the waste not want not gas nozzled shower, to today's 9 out of 10, plus marble, marble, marble, you've refused the ordinary at every turn. Which leaves only Friday before three days off. Could it be that the peace and quiet of your perfect kitchen is driving you crazy? I'm sorry, your time's up. Next Thursday then? Your design diagnosis is much appreciated, Dr. Jones. I'd love to oblige with another view of the kitchen, but alas, I do not know the identity of the designer. And I agree with you about the cooking alcove being the weak element. If I could change TWO things in the space, the second would be the tiled wall you mention. I actually like how it breaks with the rest of the room; perhaps replace it with concrete? I think concrete would be the perfect choice. It would contrast with the marble and yet be color neutral. Maybe with a glass splatter guard à la Hansensen's maple kitchen to protect against the inevitable — and then the lights. As for the artichoke lamp, it's a longtime favorite of mine. Unfortunately, it's the price of a used car, so I think I'd leave it precisely where and how it is. The table might be a Piet Hein super-elliptical. We'll keep that too. I've really enjoyed these past two weeks. I think the Javits Center was good for you. Got the blood pressure up. Happy Memorial Day weekend. Your discerning readership is much appreciated, Evan Jones. Enjoy the weekend. While I still don't know the designer of this kitchen, I have now learned the source of the cabinets: it's Obumex in Belgium.